It's not officially fall but late summer is the beginning of moving time in my garden. Peonies, iris, day lilies, daffodils and hardy hibiscus in particular better have their suitcases packed because this is when they relocate. 1. Know where the plants will end up. That means not only identifying the site but checking the soil, amending it if necessary, and preparing the site for the incoming plants including ample root space. 2. If in doubt, check the plants growing habits. Make sure you are not planting something that will grow tall where you don't want it. 3. Whatever you are moving, dig up the plant with soil around the roots. Moving soil will help minimize trauma to plant roots. 4. Water. Add moisture to where you will be digging as well as where you will be planting. Wet soil is easier to dig, which is why I time my digging sessions after a good rainstorm. You also need well hydrated soil when you plant or anything you plant will die. 5. Wait 2-4 weeks until all blooming has stopped before moving. 6. Check for bugs. If you have any bugs, treat with Neem oil spray, which absorbs into the plant to fight bugs from the inside. Do not move diseased plants or you will be spreading the issues. Mark the plants and periodically check them until the bugs are gone, then move the plants. 7. Have mulch handy. Mulching newly-moved plants greatly increases their chances of surviving the mood. Make sure the mulch is seasoned so that it doesn't burn delicate roots. 8. Make notes. Keep a little map or notes in your garden diary about where you planted items so you can check back next year. I can't tell you how many times I have moved plants, forgotten where I put them only to find them popping up a year or two later. I just found a catalpa tree I moved several years ago that survived and is now growing quite nicely. Plants will spend the first couple of years of their life growing strong roots. They will loose their green tops at the height of hot weather to survive. As long as their roots stay hydrated, the plants will survive. 9. Move on a cloudy, overcast day or late in the day so they don’t have to be stressed by full sun. 10. Check your new plantings. I periodically find a plant or two pushed out of their new holes by curious wildlife so ensure that they are staying where you put them. 11. Water daily for the first two weeks or more. To the plant this is a new growing environment so make sure you keep the soil nicely hydrated while the roots re-establish themselves. For some plants it can take several months. 12. Mulch. Once you know the soil is moist, add mulch. The mulch will help preserve the moisture but still check to make sure soil is hydrated. 13. Make notes of what other plants need to move. One more note. Moved plants in the fall will not settle in and stand straight before the end of the season but they will next year when they grow in their new garden location. Just make sure their roots don't pop out while they are settling in. I have lost count of the number of turtles I have helped cross a road. Usually they are a variety of Missouri box turtle; Missouri is home to 18 different turtle species. Over the years, it’s the box turtles that have hung around my garden. Lefty Louie was a three-legged box turtle that chose to spend several seasons in my garden, stopping by the garage door whenever he wanted a strawberry. The many turtle adventures - I do brake for turtles - also led me to carry Turtle Time Quilt and Wall Hanging. I was thinking about Lefty Louie the morning I was walking through my garden and saw a new visitor sitting at the top of my retaining wall stairs. Moving towards the back for a closer look, I realized this was one of Missouri’s common snapping turtles, not a turtle one wants to pick up and expect to still have all fingers. One of our local park ponds had a resident snapping turtle in the 1980s. When the US Army came in one summer to help clean out the pond , the crew reportedly would quickly make for landfall every time “Friskie” would surface and snap at their heels. Maybe this turtle is just walking through, I thought to myself. They do migrate through. Within minutes, it was moving towards my little goldfish pond. These snapping turtles used to be a popular food source, or so I am told. Starting March 1, 2018, Missouri Department of Conservation made it illegal to harvest common snapping and soft shell turtles for commercial use. They can still be harvested for personal use but the limit has been reduced from five each to a total of two. It shouldn’t affect many. According to the state conservation department, very few individuals reported harvesting turtles for food during their 2017 open houses but snapping turtles are commercially sold to foreign markets. Missouri Department of Conservation said turtles are loosing ground to land conversion, draining of wetlands and channelization of rivers, which have replaced their preferred habit – swamps, marshes and meandering streams. Don’t adopt or buy turtles for pets. Don’t shoot turtles for sport. It’s illegal and it puts pressures on an already stressed animal group. Report turtle poachers to Operation Game Thief 800-392-1111. Be careful where you drive, especially in spring and summer when box turtles are mating, nesting and dispersing. If you can do so safely, stop and help a turtle cross the road. Always move the turtle in the direction it is headed. Created habitat areas around your home or farm with wetlands and wooded, shrubby and grassy natural habitat. I tossed a plastic tote over it and carefully nudged it into the tote before turning it over. The turtle was moved to a large open pond about 15 miles from my house with a nearby stream. Removing the spent flower heads on plants encourages the plant to produce more flowers. It also makes the plant look nicer and is the fastest way to improve the look of one's garden. I do dead head plants in spring and early summer. Towards the end of summer and fall, however, I tend to leave the seed heads on so birds will have winter food. Many native plants are a ready source of food for wildlife including black eyed Susans, purple coneflowers, Autumn Sedum and perennial herbs. Before snipping anything off, take a look at the plant and observe how it grows. Remove the dry seed head and whatever stem portion is dead above a growing bud. This should encourage the plant to grow in a more bushy form and produce more flowers. One more note on removing spent plant seed heads. For years I used a variety of pruners, taking periodic breaks so that my hands didn't cramp up from all of the repetitive movement. Now I have a couple of sewing thread snips dedicated to gardening. These work much faster and easier than pruners and I can rotate between my right and left hand. Spent flower plant heads can be stored in bags for use next year. They can also be composted. 1. Deadhead flowering plants. Removing spent blooms will help keep plants healthy and may even give you a second and third wave of flowers. I use sewing and quilting thread snips to quickly remove spent blooms. Tiger lilies have started to bloom in my Missouri hillside garden, a sure sign of summer. If there is one plant that marks the beginning of the hot summer Missouri season, it's tiger lilies in bloom. These very old-fashioned lilies survive in most drought conditions, their flowers swinging from on top of 4-5 foot stems. Tiger lily flowers (Lilium lancifolium or Lilium tigrinum) propagate through black bubils in the axils above the leaves. That may explain why I have a number of plants scattered throughout my flower beds, their little seed starts scattered by wind and my carelessly knocking the bubils over when I walked close by. Growing tiger lilies involves planting the bubils and waiting, as it may be five years before these produce tiger lily flowers. If you have tiger lilies growing in your existing garden, keep them happy with soil amendments. I give them a handful of aged compost followed by mulch every year. I think about moving the various ones scattered around the garden so they are all together but the soil is usually so hard and dry mid-summer in Missouri. I think I will wait for more plants to grow where the original ones area, that's much easier! In the meantime, time to make another one of our charming baby jungle quilts, I think of tiger lilies having faces every time I see them! Miniature roses are shrub roses that are easy to grow and continuously bloom most of the season. Of all of the garden flowers I grow, one of my favorites are the miniature rose varieties. They come in a wide range of colors; are relatively hardy; bloom profusely when planted in the right conditions and are easy to incorporate into desk-friendly cut flower arrangements. Most of my miniature roses were giveaways from community lunches, friends gardens and garden sales. Valentine's Day and Mother's Day are favorite holidays for giving roses so the weeks afterwards are a good time to check for marked down plants. Focus on the health of the plant and leaves, you can always cut off the spent flowers and encourage new budding. Plant miniature roses where they will get at least 6 hours of morning sun in a southern exposure in well-composted soil. Miniature roses are shallow-rooted so I mix in shredded leaves to help them retain water. Once planted, add mulch and leave the area under the plant clear 4-6" of mulch. During the growing season, I give my roses a banana peel, crushed egg shells, used coffee grounds and a dash of epson salts in between doses of fresh compost mixed into the soil around them. Miniature roses are also charming cut flowers, the perfect size for desk arrangements. Once you get your first miniature rose growing well, the flowers will bloom for weeks on the plant, another wonderful reason to add these hardy perennials to your garden. Miniature roses are hardy outside in USDA zone 5 and up. My cucumbers are growing in pots on the second floor deck facing west. I was walking around my garden one morning and, at the top of the hill, I spotted my cucumbers trying to run away. Actually they weren't running, they were more like meandering out of their deck pots and making a relatively leisurely track down the deck. This was my first year to grow cucumbers from seeds in my pot garden, or my vertical deck garden for those people who look quizzically at me when I call it a pot garden. I grow only vegetables and some herbs but calling it a pot garden offers some exciting possibilities. Both cucumber plants are outgrowing their pots and need more support. When I checked the deck, the cucumber plants had definitely wound their way around the small white trellises in each pot and moved over the railing. Or in the case of one of the plants, through the side of the railing. For next year, I will have to use larger trellises to keep the cucumber plants happy. Yellow mums in bloom mid-July at Bluebird Gardens, a little early but at least not leggy. It's easy to take fall mums for granted, those little autumn blooming flowers unless you have tried to make the plants form those little mounds all by yourself. I gave that up years ago, settling instead for having just non-spindly chrysanthemums in bloom whenever they were ready. The professional advice is to pinch the mums once a week through July 4th. The pinching keeps the plant low and bushy, as well as branching so that there are more flowers in bloom. That is also supposed to delay blooming so the mums bloom on cue during their designated blooming month in the fall. I do pinch most of my mums through spring, but not all. I leave a few to grow long and leggy so that I can include them in flower bouquets. The short, stout branches are hard to manage in a vase and that is a shame because mums are one of the longer-lasting cut flowers. It's why they are a popular addition in floral bouquets, they tend to be the last flowers to die off when the rest of the cut flowers have faded. So it's early August with record summer heat and some of my mums have decided to bloom. This yellow one in particular is having a good time so yes, I am doing absolutely nothing about it. I could trim off the flower buds and try to delay flowering until later but I am not going to touch it. Some plants bloom slower in hot weather. That's what I am telling myself as I enjoy the bright sunny flowers popping up a good couple of months early. Did I mention I love surprises? My summer gardening basket of must haves sits by my den door so I don't forget things. The hot dog days of summer are here in Missouri. At around 2 p.m. earlier today I found myself "wimping out" of spending time in my garden, unheard of if you could see all of the work that still needs to get done. I mean, is a garden ever really finished?? I sheepishly put away my pruners, dusted off my hat and snuck into the house hoping none of my neighbors would see me. Then I thought this is ridiculous, it's hot, I'm retired and I'm done for the day. A friend's posting of her thermometer in the porch shade sealed the deal - 104.5F, and it's only mid July. According to the Climate Change Institute in Columbia, Missouri, the trend will be for us to have longer springs, hotter summers, longer falls and milder, shorter winters with less snow. So far we definitely had a milder winter and longer spring. 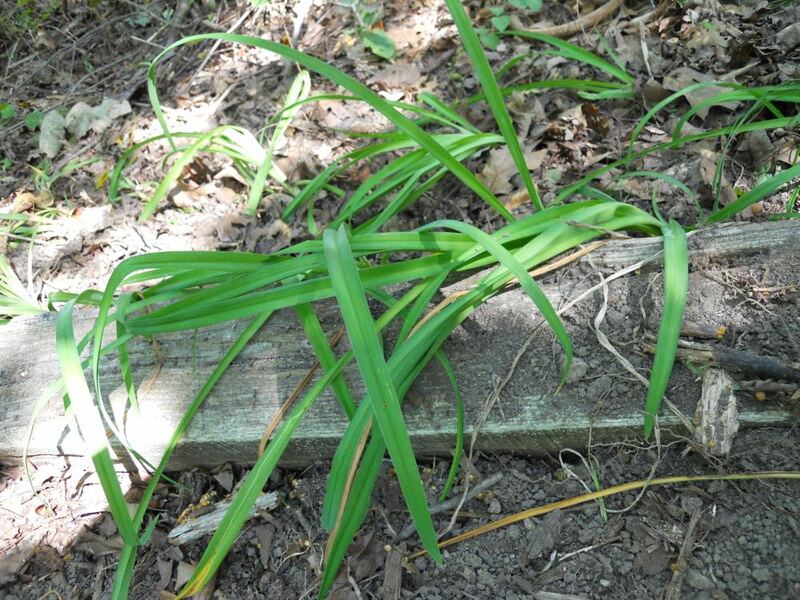 Not looking forward to a hotter Missouri August, the ones in previous decades were nothing to celebrate, the Missouri Botanical Garden calls it the "dearth," when most of Missouri's plants go into survival mode, or die off all together. It's not good news for bees, with colonies at their highest populations for the year left without a source of food. As our climate rapidly changes, we are also seeing more ticks, bigger poison ivy plants and the obvious, exposure to more dangerous sun rays. To remind myself to protect myself before I head into the weedier parts of my garden, I set up this basket of "must haves" I keep by my den door. Bug spray, sunblock, water, neck towel - and don't forget a gardening hat - are must haves! I also wear sunglasses but if you don't regularly wear glasses, add a pair to your basket. No need to spend a lot of money on the basket, I picked this one up at one of our local thrift stores for $1. No, wait, it cost me $2, this was the second basket I bought because my cats appropriated the first one as a napping spot.